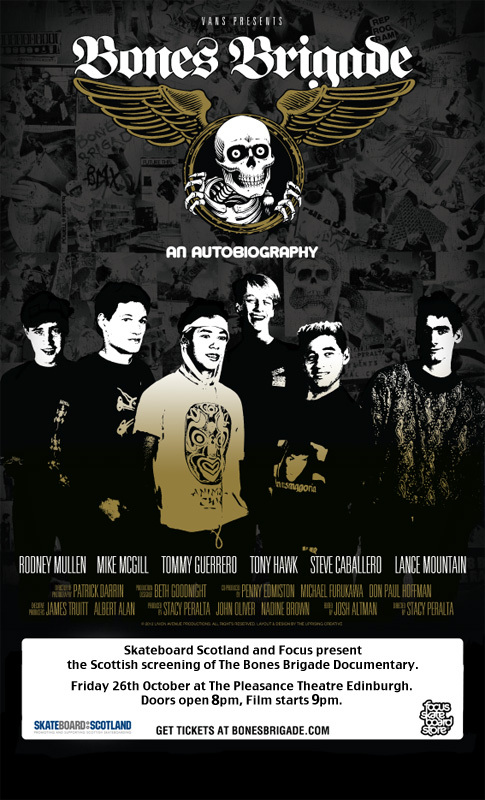 Skateboard Scotland and Focus Skate Store are incredibly proud to announce the Scottish screening of the long awaited Bones Brigade : An Autobiography movie from Stacy Peralta. Chronicling the emergence of one of skateboarding’s first superstar teams and the highs and lows that came with it. Tickets are available here http://bonesbrigade.com/preorder/#!/screenings and this really is not one to miss. Hope to see you all at the Premiere! It is going to be Rad. Concordo totalmente nonostante le idee espresse fino ad ora. Continuate cosi.